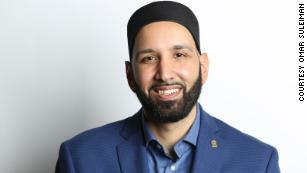 Imam Omar Suleiman is the founder and president of the Yaqeen Institute for Islamic Research and an adjunct professor of Islamic studies in the graduate liberal studies program at Southern Methodist University. The opinions expressed in this commentary are his own. (CNN)My wife and I decided to take our kids to a synagogue in Dallas the night after the massacre at Tree of Life in Pittsburgh to grieve and show solidarity with the Jewish community. My 5-year-old played with kids his age while we mourned inside, resisting hate even unknowingly with his innocence. My 9-year-old, on the other hand, had lots of questions. Who were those people? Why would anyone want to kill them? And were the ones who pulled the triggers the same white supremacists who carry guns in front of our mosque in Texas? Not only did she recognize the sameness of the Jewish children around her. But she also saw the sameness of the hate that robs us all of our peace even in our places of worship. It isn't easy being Muslim in countries witnessing a resurgence of white supremacy. We are usually colored, and always viewed by some as suspicious. The spaces we go to shop, relax, and spend time together have become increasingly hostile. And the mosque is supposed to be the safe space. The space where women can wear their hijabs without fear of anyone trying to pull them off or shout obscenities at them. The place where men can wear their kufis and pray without fear of aggression or assault. The place where children can be as Muslim as they want, jumping around in their superhero shirts and sports jerseys with other kids that are facing increased bullying by their peers, and sometimes even their teachers. But now the mosques are no longer safe spaces. In the past 15 years, we've seen hundreds of mosques vandalized and firebombed here in the United States. And after watching television coverage of the US travel ban affecting people from Muslim-majority countries, a white nationalist terrorist in Canada walks into a mosque and murders six worshipers in cold blood to send a message to Muslims that they were not welcome in Canada either. And now with the devastating terrorist attack against Muslims in New Zealand during their Friday prayers, a new element has been added. Many young children will have seen the leaked videos of the terrorist live streaming his massacre. These Muslim children will likely see themselves both in the video game style shot of mowing down people with bullets to win, and in the real life children being gunned down because they worship and look like them. The trauma will be immeasurable, yet the message unambiguous: you are neither welcome nor safe here. I've already started receiving messages from Muslims wondering if they should skip the Friday prayer today. Others are simply asking what security measures will be taken. And others are asking how this could happen. I'm also receiving messages from Jewish allies who I messaged just a few months ago asking how to help. And the main voice comforting me is one of my closest friends who happens to be an AME pastor who I stood shoulder-to-shoulder with in mourning in the wake of the attack on his denomination in Charleston four years ago. But the message we must both live and give our children is one of resilience. That they should wear their hijabs and yarmulkes with pride, embrace each other as people, and face this bigotry with perseverance. There are so many elements to this particular terrorist attack that should cause us to rethink the impact of hateful rhetoric, games and movies that glorify violence, and ideologies that dehumanize the other. But our communities must move beyond the moment. Can fascism and white supremacy be defeated by candle vigils and solidarity gatherings? Or is there something more we can all do? The vigils, flowers, and messages of solidarity do help. When a community is in pain precisely due to the hate of those who don't bother to get to know it, it is also comforted by those who send love to it even if they, too, don't know it. But a resilient community doesn't merely continue on after terror -- it mobilizes against it. This past November I had the blessing of visiting a mosque in Minnesota that was firebombed in 2017. The terrorists particularly targeted the office of the Imam, who thankfully was in the prayer area at the time of the attack. That very same mosque, a year later, was phone banking with interfaith allies to get people out to vote. It converted the anxiety caused by the firebombing into action. We, too, must do the same. It starts with us recognizing our common humanity. It moves to us recognizing the common place of hate. It ends us with taking action in love to defeat it. In my local community, several have lined up to do training and apply for a conceal license permit at the police station this Sunday. Next time any kanjur comes to our mosque, we will hang him on top of the minaret. Don't spread such nonsense. This time is similar to The Prophet's (saw) time in Makkah. Muslims should be patient and avoid any kind of violence. He's speaking of defence. IT'S NOT VIOLENCE. Not even defence, Muslims in west have to be very careful. Law enforcing agencies are quite efficient in the west. There is no need to act courageous/stupid. Just stay calm, be honest when dealing with other people, don't be benefit scavenger, be polite all the times, spread the message of Islam in the best possible way by word and by displaying best of character. Western world is ready for the message of Islam. Just stop being stupid, greedy, dishonest and sect specific. You want to make West like Muslim countries, no value of life, no human rights, killing people in the name of religion? Islamic history me kisi dushman ko masjid ke minar ke sath latkaney ki misaal aap ko kahan milti hai? Don't take everything literally. I am giving you an example of the situation. Now in Pakistan we have seen police and rangers with LMGs outside of mosques for 10-15 yrs. We are are used to this. In Karachi, you may get killed and people will stand round robin and show teeth at how somebody dies.. The society in western countries is different. That is why police commanders and officers showed up in mosques in NY as early as Fajr. They know the situation is worrisome. Aapki konsi mosque hai bhai? As muslim's it is our duty to spread the message of Islam. The Prophet (saw) has himself given us this duty. We must do it with patience, humbleness, sacrifice and showing good character. Anyone not doing it will be answerable to Allah. We don't need guns or self defence in the west. Our foremost duty is to improve our character so that people in the west could see Islam in body and soul. My own judgement is that atleast Europe is ready for it. We just need to behave in a way that they start studying Islam in essence. Once that happens Islam will do the job itself. I think Muslims should first convert Muslims to Islam by their good character . Muslims in West are not there to spread Islam but to live a better life ,a life of dignity which is not possible in Islamic republics! That's what you think. There is no before and after in this world. Things go in Parallel. If you live in a Muslim country, yes you should do Dawah there but if you are living in the west for whatever reason it is our religious responsibility to give Dawah. It is just like making a mosque or offering your prayers which is not what these people came here for but do it anyways as part of their religious obligations. P.S: Even with the present state of Muslims and lack of Dawah a lot of people are converting to Islam and you see them more and more.